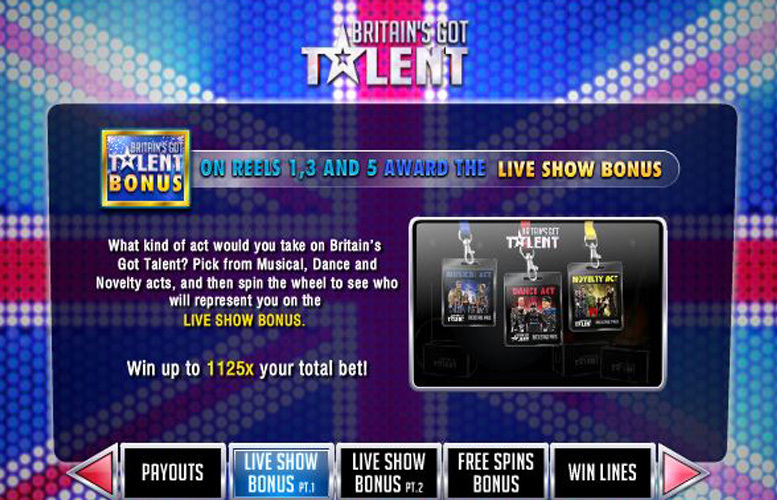 Slot fans who dream of taking part in one of Britain’s most popular TV shows can get a taste of what it would be like by playing the five reel, three row and 20 payline Britain’s Got Talent slot. Themed around the long-running ITV talent show, the slot features contestants from six seasons of Britain’s Got Talent and includes a bonus game in which players try to take a contestant all the way through to a virtual final. The fun and innovative Britain’s Got Talent theme is sure to delight fans of the popular TV show. The slots top payline jackpot can be worth a whopping £500,000, making it one of the most generous of any game. A ‘Live Show’ bonus round adds extra interest and fun to the slot’s gameplay and is a great way to further utilise the slot’s overall theme. A vast array of staking options are available to players, as they can alter both their line bet and the number of active paylines per spin. Apart from the fact that the slot will probably be a little off-putting to those players who don’t watch the TV show, there’s very little to criticise the slot for. 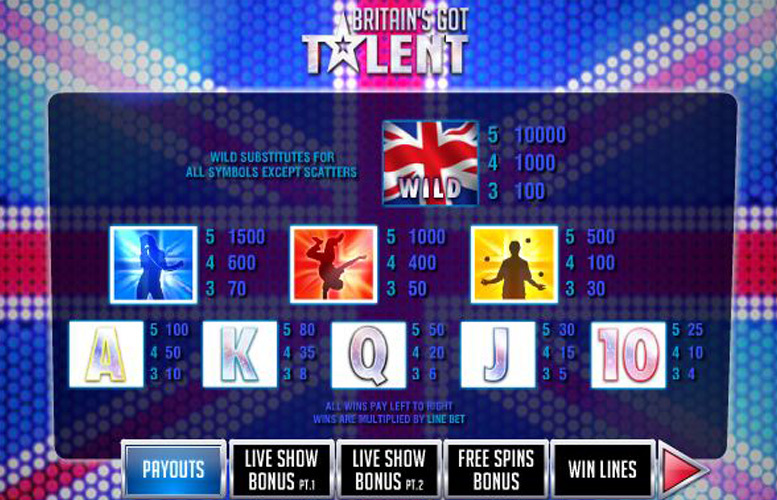 The Britain’s Got Talent main game is a traditional five reel slot game which can utilise up to a maximum of 20 paylines. The highest value payline jackpots are those which result when five matching symbols appear along any payline that was active for the spin in question. 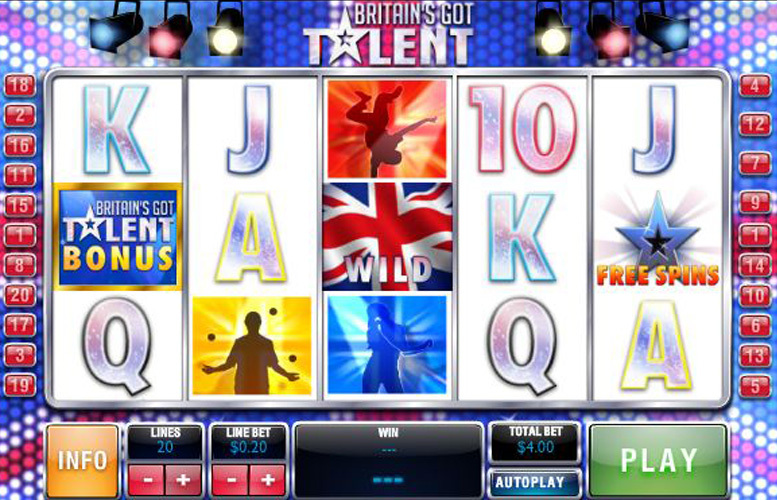 The biggest jackpot of all is triggered if five of the Britain’s Got Talent wild symbols align on an active payline. If that particular symbol combination does appear, the player’s jackpot will be worth 10,000 times their line bet which means it can reach a lofty £500,000 if they select the maximum line bet of £50. The Britain’s Got Talent slot is packed full of additional features which all borrow elements from the TV show in one way or another. Those features include wild substitutions, a ‘Live Show’ bonus round and free spins with sticky wilds. When the Britain’s Got Talent wild symbols appear on the reels they can substitute for any other symbols – apart from the bonus and free spins symbols – like a joker in a card game. When such a substitution occurs, the wild will substitute for the symbol that will create the most valuable possible payline combination. As well as wild symbols, the Britain’s Got Talent slot also features bonus symbols which can appear on reels one, three and five. If one of those symbols appears on each of those reels at the same time, it triggers the Live Show bonus game. In that game players must choose to be represented by either a singer, dancer or novelty act and then spin a wheel to see who their contestant is. They can then take that contestant through the live rounds of the Britain’s Got Talent show and collect winnings based on how much applause they receive. A third and final special symbol to be found on the Britain’s Got Talent reels is the free spins symbol which can appear on reels two, four and five. When one such symbol appears on each of those reels, free spins are triggered. The number of free spins triggered will be equal to the total of the numbers appearing on each of the free spin symbols. 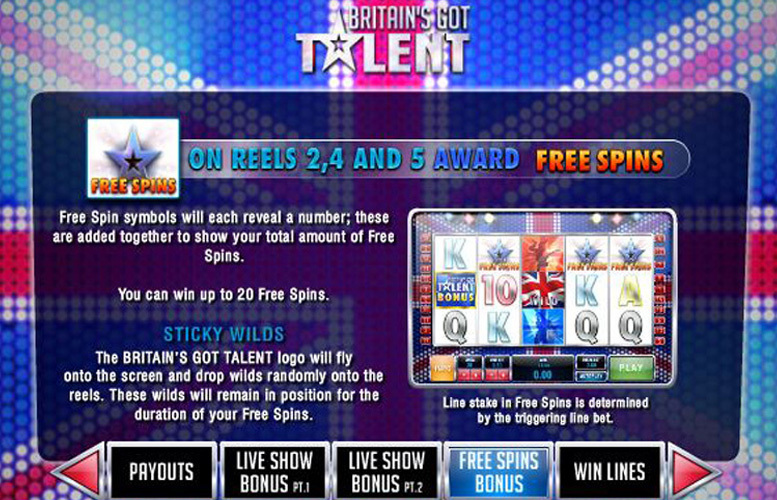 During the free spins, the Britain’s Got Talent logo will drop wilds onto random spaces on the reels and those wilds will stick in position for the duration of the free spins. Away from those special symbols, the regular symbols which players will most want to see appearing on the reels are those depicting the singer, dancer or novelty act. That trio of symbols, after all, are the ones which can make up the slot’s most valuable five symbol payline combinations. Five of the singer symbols lining up along an active payline results in a jackpot worth 1,500 times a player’s chosen line bet. If it is five of the dancer symbols which appear, the payout will be worth 1,000 times the bet per line. A five novelty act symbol combination, finally, triggers a jackpot worth 500 times the line bet. Opening its doors to anyone and everyone, much like the TV show itself, the Britain’s Got Talent slot caters for players of all budgets by offering two different ways to alter the amount wagered on each spin. Firstly, players can choose to have anywhere from one to the maximum of 20 paylines active per spin. Secondly, they can then set the amount they wish to bet per active payline between a minimum of 1p and a maximum of £50. That means that the minimum a player can bet per spin is 1p and the maximum is £50. Slots themed around TV shows are always popular with players but the Britain’s Got Talent slot game has far more to offer than just its fun and recognisable theme. It is, after all, a slot which boasts a really impressive top jackpot, immersive gameplay and a wide range of staking options. Standing at a lofty £500,000 when the highest bet level is selected, the Britain’s Got Talent top jackpot is one of the most generous around. What’s more, players’ winning can also be supplemented by wins for the fun ‘Live Show’ bonus game and handy free spins, both of which also add further interest to gameplay. 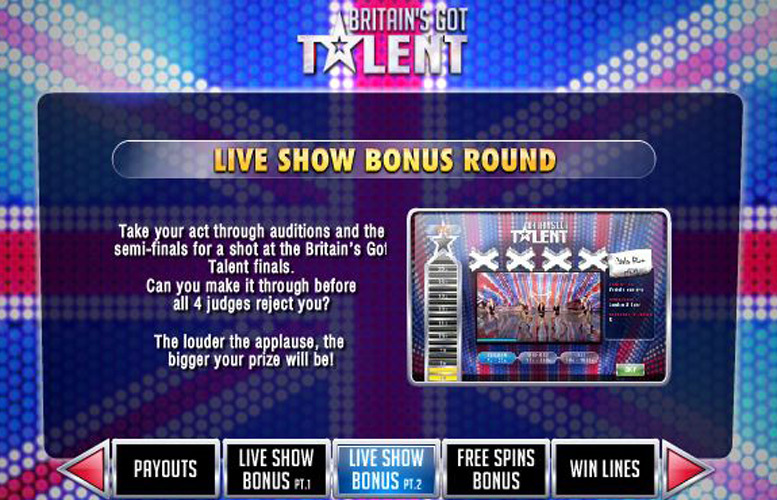 Add to all of that the fact that the slot caters for players of all budgets or wagering preferences, and you come to realise that Britain’s Got Talent is an all-around excellent slot. This game has a rating of 5 / 5 with 704 total reviews by the users.